The winter months can be ideal for planning our gardens, looking over catalogs, doing research into plants, and otherwise setting yourself up for success for the growing season (as well as providing some inspiration during dreary weather). One particular type of habitat garden that can be planned is one focusing on Monarch Butterflies, but which ends up benefiting many other pollinators and wildlife. Since my own Arlington County has committed itself to a National Wildlife Federation program called the Monarch Pledge, I thought I'd provide some details to help you support this pledge and otherwise provide information on setting up a particular type of Pollinator Patch. The Monarch Pledge is one taken by mayors and other local governmental leaders committing themselves to create habitat and educate citizens on how they make a difference at home. Frankly, this short article is an attempt to help do that. A Monarch Butterfly shares a meal of Swamp Milkweed nectar with a Hummingbird Clearwing Moth in the Certified Monarch Way Station at Gulf Branch Nature Center. More and more people are becoming aware of the plight of the monarch butterfly. While it has been introduced or spread into some new places it was not found before, there has been a large decline in its numbers in its historical range. This large orange, migratory butterfly may have gotten its name in honor of King William III of Orange and because it was said to rule over a vast domain. Now however it faces many threats including habitat destruction (both here and on its wintering grounds). What may be a weed to us is often an important food source for an animal. 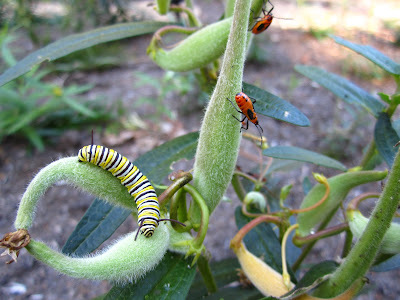 In this case, the sole food for monarch caterpillars (called the host plants) are plants in the milkweed family (Asclepias species for the most part). Since the caterpillars can feed on nothing else, this is one "weed" that needs to be conserved and indeed encouraged. 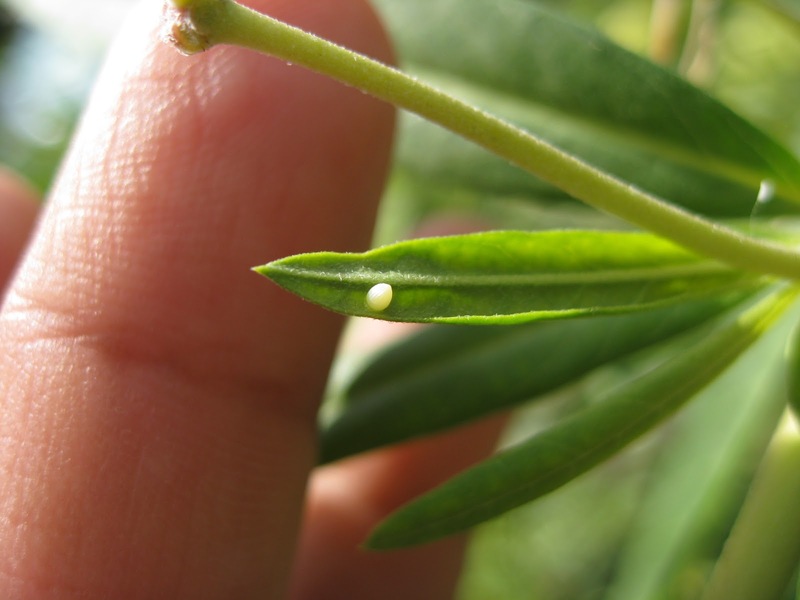 A Monarch Butterfly egg hidden under a milkweed leaf. Thus came about the notion of planting Monarch Way Stations. The idea was put forth by one of the leading monarch conservation organizations, Monarch Watch. By having individuals and communities plant both larval food sources (milkweeds) for the young and nectar sources for the adults, the loss of habitat could be offset and some conservation gains could be made. This plan is now getting a lot of support from schools, butterfly clubs, and many other organizations. So what do you need to make your own positive impact for monarchs? In addition to restricting pesticide use, why not plant a garden specifically for monarchs and get it certified as a Monarch Way Station? It is not as difficult as you might think as long as you keep certain principles in mind. The first principle is to make sure you have a good location. Since butterflies are “cold blooded,” an area that receives 6 or more hours of sun is better than a shady area. This also helps since many of the blooms adult monarchs prefer are sun-loving. Next try and group your plants together and plan for flowers that will bloom throughout the season. It is easier for butterflies to see masses of blooms and a longer blooming period will of course provide more nectar food sources. For certification, at least 4 nectar sources are required, but the more the merrier. Native plants are the way to go, with some of the best being the goldenrods, joe-pyes, ironweeds, asters, composites, and coneflowers. Avoid cultivars such as double flowered varieties which may produce less nectar, and obviously don't use pesticides which may harm the caterpillars or other beneficial insects your garden may attract. Sweet smelling Honeyvine (Cynanchum laeve) is one of several vines that Monarchs will also use as host plants for their caterpillars. Going by various other names such as Sandvine or Climbing Milkweed, it may be a little too aggressive for formal gardens. Most importantly, provide milkweeds (Asclepias species mostly) as host plants. For certification, at least 10 plants of 2 different species are required. Luckily for us, milkweeds are an adaptable group and there are probably some that will do very well despite your growing conditions. Virginia is blessed for instance with 13 native Asclepias species plus 4 climbing vines that Monarch caterpillars can feed on. Most are also deer resistant, at least once they get more mature. For the best results, cut the some of the stems back in late summer after they've bloomed. Fall is the when we get the most Monarchs laying eggs on our milkweeds. Since the mother butterflies prefer young, more tender growth, you can provide this by timing your pruning so there are new leaves by September or so for the arriving Monarchs. Just make sure to leave a few to produce pods for seeds. A Monarch caterpillar feeding on Common Milkweed. The local monarch favorite is Common Milkweed (A. syriaca), but this may not be the best for a formal setting since they spread by underground stolons and so will not "stay" where they are planted. They are certainly quite useful in less formal and school settings and are the favorite because they have the most toxic compounds (cardiac glycosides) the caterpillars need to make themselves distasteful to predators. The copious amounts of nectar that Common Milkweed produces attracts many pollinators such as this Perplexing Bumblebee, with a Pennsylvania Bumblebee in the background. While not suitable for every garden, Common Milkweed is favored by many insects besides Monarch caterpillars. 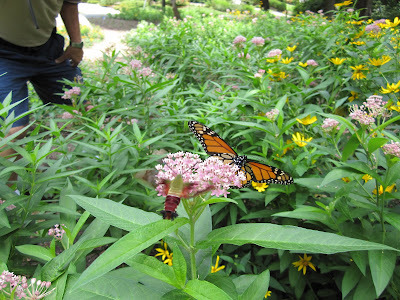 A better option for most gardeners might be Swamp Milkweed (A. incarnata) which, despite its name, does fine in regular garden soil and doesn’t spread by runners. It will do well in clay also (as does the Common Milkweed). Most consider its blooms to be better looking as well. The same is even more true for Purple Milkweed (A. purpurascens) which will also handle wet conditions, but as long as they eventually drain well, and it does very well in sandy situations. If you have hot, dry conditions, then try Butterflyweed (A. tuberosa). Once established, it can take droughts and even some cutting. It is the least favored by monarch caterpillars though because it has very little toxin (cardiac glycosides) in its leaves, but other butterflies and adult monarchs love it as a nectar source. Why do you think it’s called butterflyweed? Other native species that might work for you include another species that does well in just ordinary soil, the Whorled or Horsetail Milkweed (A. verticellata) which tends to stay short. White or Redring Milkweed (A. variegata) is also supposed to be easy to grow, but much harder to find, and it can take wet areas. If you have dry, sandy soil, try Blunt-leaf or Sand Milkweed (A. amplexicaulis). There are also some species that will tolerate shadier conditions such as Green Milkweed (A. viridiflora), Poke Milkweed (A. exaltata), and Four-leaved Milkweed (A. quadrifolia). The last one is native just west of here. There are plenty of native alternatives for just about any garden site, as you can see, so it's best to stay away from some of the exotic milkweed species such as Balloonflower or Bloodflower which some people believe may have some negative drawbacks for our local Monarchs. Green Milkweed is among the more shade tolerant milkweeds. This is from the garden at Long Branch Nature Center. While Monarch Way Stations and their component plants are meant to help the Monarch, obviously many other animals benefit. Twelve different species of caterpillar have been found to also feed on milkweeds, though many are only native South of our region. More over, 457 different insect species were documented on a single milkweed patch during a one year study by Lewis and Clark Community College in Godfrey, Illinois. A Monarch caterpillar feeds on an immature milkweed pod along side immature milkweed bug nymphs. Many milkweed feeders have bright colors to advertise their distastefulness to predators from their use of toxins sequestered from the milkweeds. These insects and other arthropods then feed many other animals. While pollinators visiting the flowers are the most obvious of these, there are quite a few others. For example, 97% of our terrestrial birds feed on insects, specially caterpillars, and so will benefit from your garden. All 17 species of bats we have also eat insects, so they all benefit as well. Then of course comes the enjoyment we get from the garden we've provided. It's a win-win for everyone involved. Great Spangled Fritillary Butterflies on Swamp Milkweed.